34°F!! I was hoping to record another PBC video tonight to submit for Friday. But since it is above freezing, it's not going to happen. Of course this means slick roads for a while and these temperatures are definitely not normal. On Thursday morning, I have an appointment with the snowplow installer. They want to swap out the wiring harness as one of the plow mounted headlights is intermittent. I'm still debating whether to hang around in their waiting room or take the bus somewhere else. In my last post, I was hoping that splicing the wire was sufficient to fix the throttle side heated grip. Unfortunately, it still didn't work and I haven't dug into it anymore. It may be that when I tightened a set screw on the throttle lock it dug into the heating element sufficiently to cause it to fail. My next attempt at reliable heated grips are these that I picked up at the local Harley/BMW/Honda/Victory/Polaris shop. They are sold for use on Polaris snowmachines aka snowmobiles. I'f they last at least as long as the grips I figure that I am ahead as they are a fraction of the price. Even being purchased locally. After going to all of the shops, none had any generic 7/8" motorcycle grips. What they had on the shelves were for snowmachines and ATVs both of which don't have throttle tubes. So I ordered some generic gel grips from Amazon made for, as they put it, BMW Ducati Harley Honda Kawasaki KTM Suzuki Yamaha. Even with Amazon Prime it'll still take a week for them to get here. Fortunately, the weather the next couple of weeks is supposed to be really pleasant unlike some other parts of the country. When I had Aerostitch repair my Roadcrafter last fall (under warranty), I mentioned that the zipper pulls had come off of both of the main zippers. Their solution was to completely replace both zippers. After I got it back, both zippers were hard to slide since they were new and I didn't receive the little one-time-use package of zipper lubricant like I did originally. When I initially applied their lubricant to the zipper, I immediately recognized the smell as what I used to use for chain lube on my bicycle back in the day. I finally got around to picking up some of the bicycle chain lube and applied it to the zippers. Now they slide very easily just like the old zippers used to do. The Tri-Flow goes on wet but dries very quickly leaving bits of teflon on the zipper. 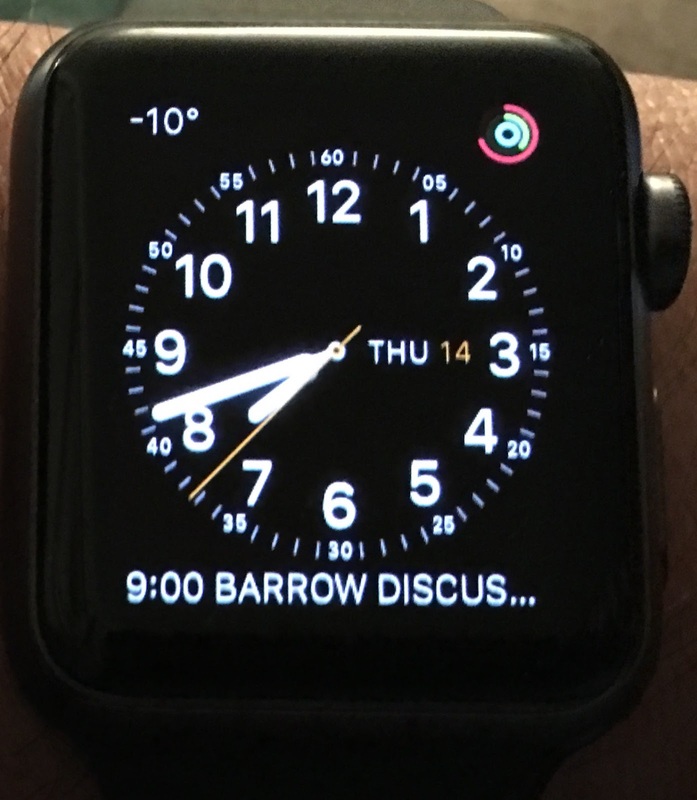 I'm still liking the Apple Watch. I discovered a new weather app that includes random comments as part of the report and predictions. 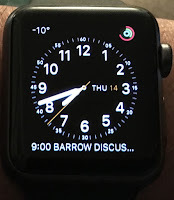 This is a screen capture on the watch. Here are the next six PBC videos. Nothing very spectacular or even interesting in any of them. Today was a cold, frosty day with wonderful clear, blue skies. 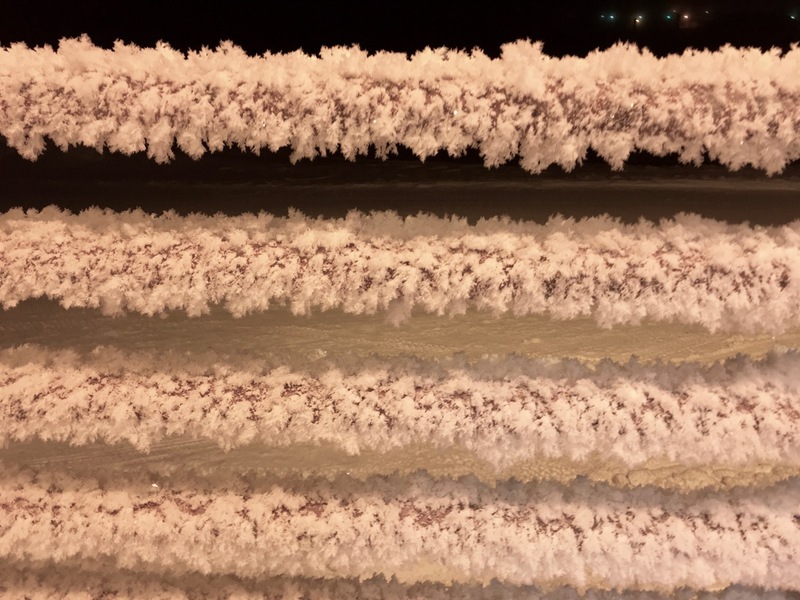 Early this morning, the temperature was around -19°F. A good enough reason to not go for a ride. After Bridget and I went to the College Coffeehouse, she encouraged me to go for a short ride if for no other reason than to capture some non-dark video. 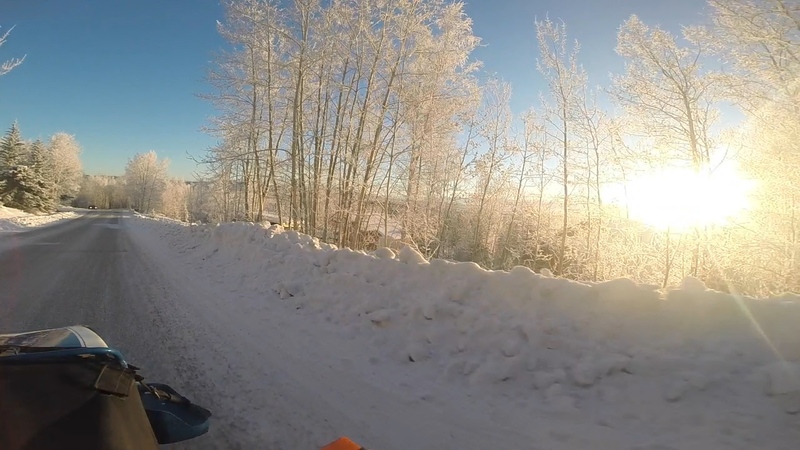 The trees were covered with frost and I headed down the road to the dog mushers hall to start the PBC video. There was a race going on and I thought that I had the GoPro running but when I got home, the file was unreadable. I reformatted the card and re-installed the firmware. Hopefully all of this flaky behaviour stops. The picture is just an frame of the video. Later in the afternoon, we went to Ursa Major Distillery off of the Parks Hwy near Ester. A friend was doing a soft opening of his new pizza business, The Hungry Robot. Pretty nice looking portable oven! There were some problems getting the fire going inside of the oven so we left after a couple of hours as Bridget had plans for this evening. I had heard that there was a distillery in Fairbanks but I had no idea where it was. This photo by Steve Sabens was posted about 7:00pm showing that they got the oven nice and hot and was producing pizza. It gets up to about 1000°F and will cook a pizza in a little over a minute. This was a test on how things will go (practice run?) with real customers. We'll try again this coming Tuesday when they will be set up at HooDoo Brewing Co., a small local microbrewery. Here is PBC #34 that I recorded today with the sunlit frosty trees. It's been awhile since I had a picture while riding. 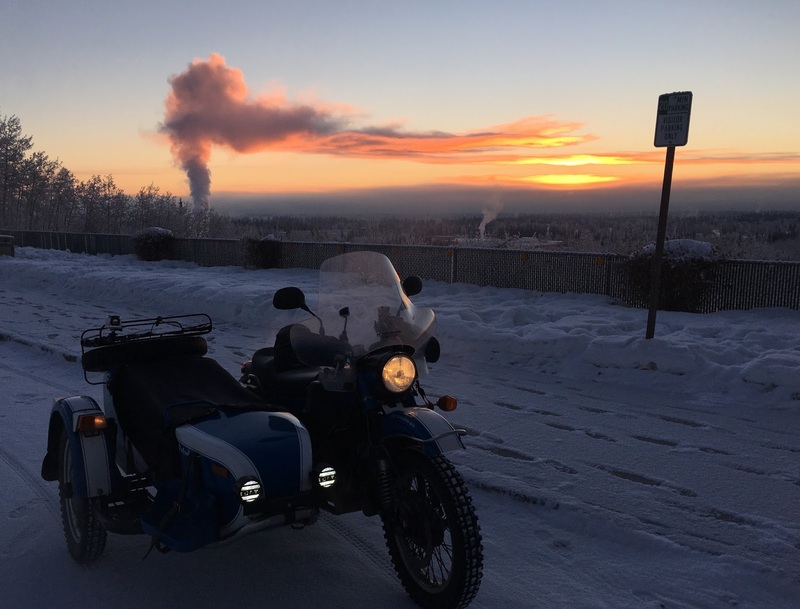 The sunrise behind the clouds with the exhaust from the university power plant was enough of a reason to stop. The exhaust turns down since it's cold and calm enough for there to be a temperature inversion. Another reason for stopping is that one of the heat wires in my left glove was burning the back of my hand. The photo was taken from the turnout across from the natural science building and one of the few other areas on campus with a good view of the valley. Here is PBC #33 that I had recorded from the morning ride. I had picked up another method of powering the GoPro since the solution I used during my road trip stopped working. The former solution powered the camera through the 30 pin connector on the back that was meant for some of the optional backs such as an extra battery. I think it stopped working after I updated the firmware on the camera. I still had the waterproof case that I had modified to allow me to plug in a mini-USB cable and that has been working but the case is, obviously, no longer waterproof. I found another option that has a circuit in the form factor of the GoPro battery and door. It snaps in place of the battery and has a 6' USB cable. Since I still had the back with the waterproof gland from the 30-pin adapter, I cut the 6' USB cable, ran it through the waterproof gland and re-soldered the cable back together and covered the splice with shrink tubing. I took it out for a test ride this morning (see PBC #30) and it sort of works. 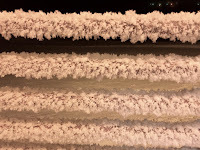 Whenever there was a lot of vibration from ice on the road, the camera shut off. The remote would lose connectivity but will continue to happily report the last status that it had. I was also trying a new camera location with the monopod fixed vertically to the rear rack. I'm not sure I care for the new location and it could be contributing to the vibration problem as it's less stable. Here is PBC #30. 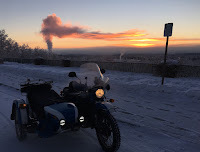 Another below 0°F ride. After about 20 miles, I was thinking that the heated gear wasn't working again. But since it was both the liner and the gloves, I finally figured out that I had forgotten to plug them in when I put on the riding gear. After stopping to plug them in, no problem and toasty warm again. I ended up riding about 65 miles before stopping at College Coffeehouse. Today was foggy probably due to open water. You can just see the open water as a dark like in the distance. 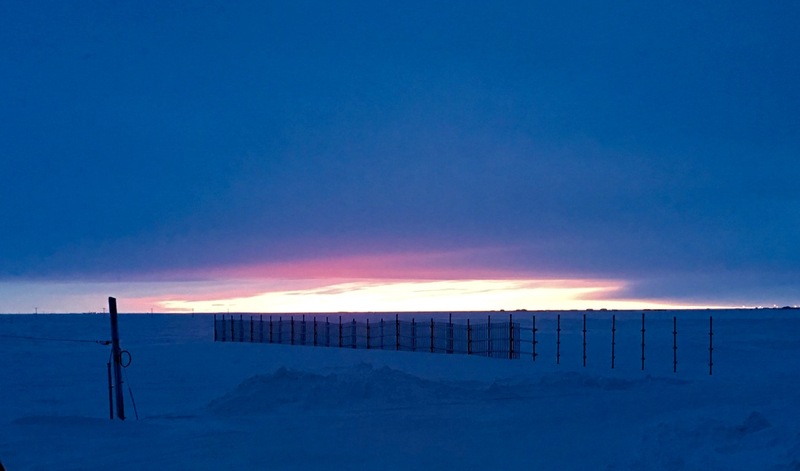 I was told that there was a sizeable crack in the sea ice near the NARL campus but I couldn't find it. There was some concern as there is a group coming up next week to work out on the ice. The was taken from the same location except looking south. The airport is on the left and if you look closely, you can just make out some of the dishes out on the satellite farm. The sky colors here are fabulous. I was able to record another video with the GoPro plugged into a powered USB hub. The video was started at 8:53am and runs until 4:05pm. It was recorded as individual frames taken at 30 sec intervals and the resulting video was slowed down to 85% to make it match the selected music. I also have uploaded the PBC videos that I had recorded on my one day back home last Monday. PBC #25 - Recorded running around town in the morning. 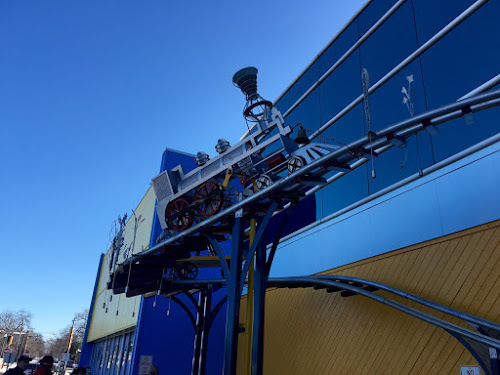 Today's activity was the DuPage Children's Museum in downtown Naperville, IL. Being the last weekend before school starts it was, quite naturally, crowded. Not Disneyland style crowded but the parking lot was completely full by mid-morning. This was just an animated sculpture outside the door with moving parts and lots of clanking sounds. After a light lunch, I opted to simply sit in the car and rest rather than battle the multiple birthday parties going on inside of the museum. It was a very nice museum with almost everything interactive. The weather has been beautiful the last couple of days with sparkling blue skies though the light wind makes it feel colder than the thermometer says. I didn't bring any cold weather gear (coat, gloves, hat) with me on this trip so I haven't spent much time outdoors. Even though it was only in the 20s and 30s (°F), the wind and humidity made it feel really cold. After the museum, we stopped at a Trader Joe's to pick up some snacks for the flight back tomorrow. Trader Joe's and Whole Foods both accept NFC payments. I had used Google Wallet now known as Android Pay last year with my Nexus 4 and the only problem was that it needed Internet access when being used and the GCI partner is T-Mobile. Horrible coverage in San Francisco limited it's use. On this trip I have been using either my Google Wallet card or Apple Pay with my iPhone (AT&T). Using Apple Pay is so quick and simple with the fingerprint reader. Simply double tap the home button with the correct finger and put the back of the phone near the terminal. When the payment is completed, the phone sort of "clicks". That's it. Since the Nexus 4 has no fingerprint reader you had to enter your 4 digit pin when paying. Not quite as convenient. In all cases, I get a notification on the phone very shortly after any transaction. With the Google Wallet card, it's usually within a minute. Apple Pay uses one-time card numbers for each transaction so the vendor never receives your actual card number. Android Pay may work the same way but I haven't heard very many details. I don't know anything about Samsung Pay as I don't have a Samsung phone. I was looking through my photos today on my phone looking for something that sort of represented 2015 and this sort of stood out to me. 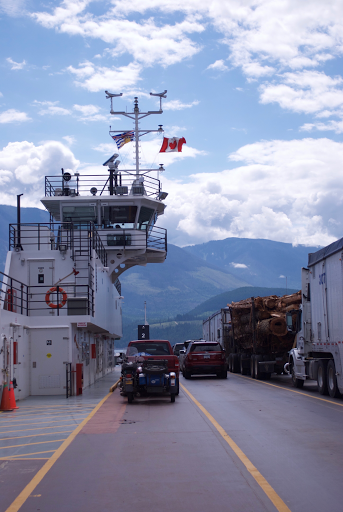 This was one of the BC freshwater ferries that I enjoyed running into during my road trip. What stood out is not that I like riding on ferries but that they were completely unexpected. Discovery of them was due to random traveling without a real destination besides "south". After discovering them, I started to look through paper maps for more of them. There is no GPS setting for "prefer free ferries". After some thought today, I guess I do have some rides "planned". There is D2D on June 16th and 17th. The family reunion in Seward is the following weekend. And there is another reunion in the PNW in 2017. But that may not be a 4-wheeled trip. 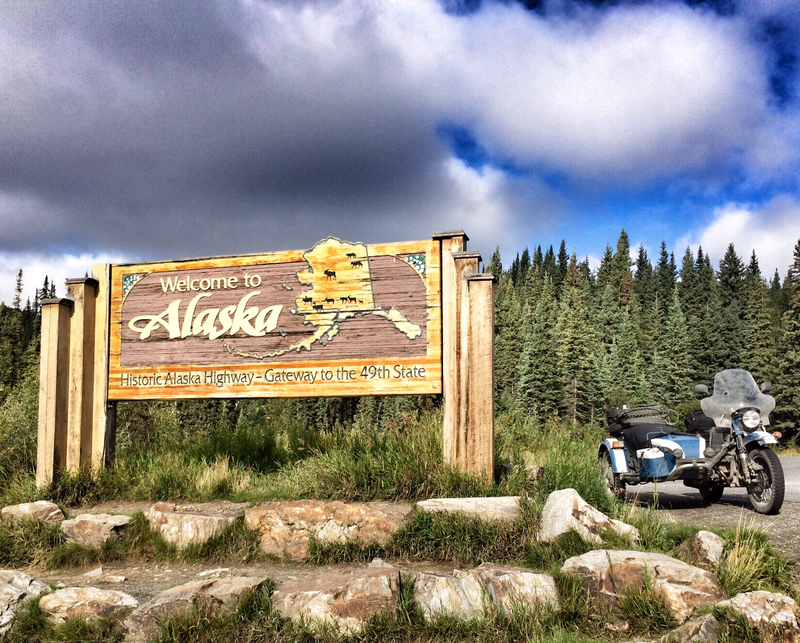 I still would like to go out to McCarthy again and ride the Denali Hwy sometime. 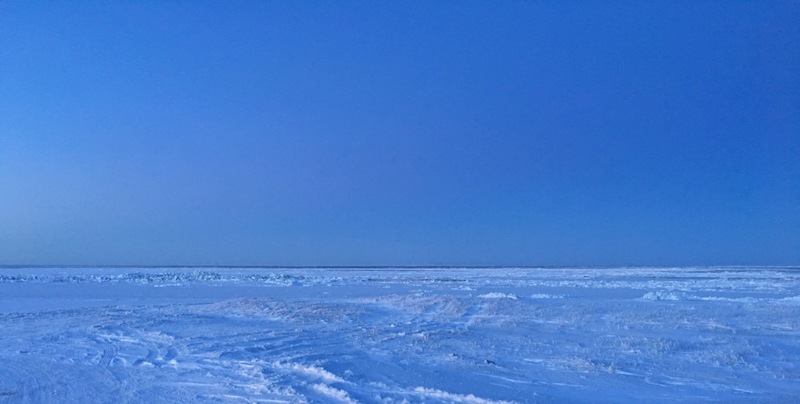 I'm told that there are plans for a "real" road between Yellowknife and Inuvik instead of just an ice road. That could be fun just because it's new. So that is the extent of my planning. I do put in some time and effort deciding what to bring and how to carry it but less on where and when besides general guidelines. On last Wednesday's #MotoChat on Twitter, the topic was riding plans for the coming year. Upon reading the topic, I was sort of dumbstruck that I hadn't even given it a moments thought. Maybe because the current riding season hasn't really ended. This picture was taken only one day away from home at the end of my trip last summer. I posted that I had no real plans except riding around Alaska and the Yukon Territory. Do others have riding plans already? BTW, if you have a Twitter account, please join #MotoChat at 1:00pm Pacific time on Wednesday.